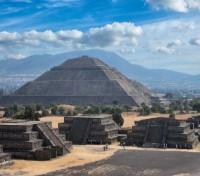 Private guided tour of the ancient city Teotihuacan and its pyramids. Float down the Usumacinta River to the Yaxchilan ruins deep in the Lacandon Jungle. Discover the carved stone stelae in the ruins of Chincultik. 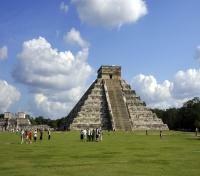 Visit countless Mayan ruins, including the incredible Chichen Itza led by expert private guide. Expert selection of premium accommodations. Enjoy a privately guided tour of the World Heritage of Teotihuacan and the Historic city center including Templo Mayor archaeological site and special collections at the famous National Museum of Anthropology. You will be picked up in the hotel lobby in the morning for a full day privately guided tour with English speaking guide of the Teotihuacán Pyramids, the enormous Pyramids of the Sun and the Moon. Your guide will enhance your experience with expert explanations of the importance of the site and its place in the rich history of Mexico 's many layers of pre-Columbian civilizations. You will then continue on to the historic city center with visits to the Zocalo flanked by Mexico’s most important and impressive buildings including: The National Palace, The Metropolitan Cathedral, a look from above into the Templo Mayor Aztec archeological site, the Palace of Fine Arts (admission included). Time for lunch will be provided but this is not included in the cost. At the end of your tour, you will be transferred back to your hotel. Meet your English speaking guide in the lobby of your hotel for a privately guided visit of Mexico's southern neighborhoods. Explore Mexico City’s southern neighborhoods that feel like small villages despite being part of the big city. Your guide will lead you in an exploration of the tree-lined streets of San Angel and Coyoacán and along the waterways of Xochimilco. Walk the footsteps of some of Mexico’s most revered artists and writers, including a visit to Frida Kahlo’s Casa Azul – a blue house where Mexican painter Frida Kahlo was born and later died, now a museum dedicated to her life. 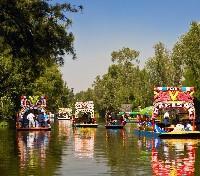 In Xochimilco, you will explore the canals while floating on a colorful boat called a trajinera to learn about the Aztec’s ingenious technique for growing food upon the fertile riverbeds of the pre-Hispanic canals - the chinampas are still in use today but for growing flowers rather than food crops. At the end of the tour, you will be transferred back to your hotel. 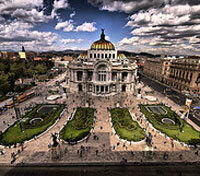 Includes: transportation, English speaking guide, entrances to Frida Kahlo Museum and Trajinera boat ride. Your flight from Mexico City to Tuxtla Gutierrez (not included) will last approximately one hour and 30 minutes. Meet your driver at Tuxtla Gutierrez Airport and enjoy a private transfer to your hotel in San Cristobal de las Casas. A gift to the eyes and senses, where a series of exquisite and unexpected details meet charming colonial atmosphere and style of a 16th century property. 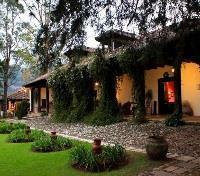 Parador San Juan de Dios is the most luxurious option among San Cristobal de Las Casas boutique hotels, a historical former hacienda with upscale services that set the pace. 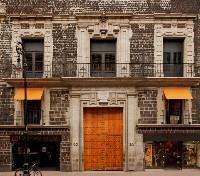 At Hotel Parador San Juan de Dios art and architecture seamlessly blend. Each space is decorated with pieces of the 16th-19th centuries, while our Museum of Sacred Art exhibits a beautiful sculpture collection. Regardless if you’re enjoying exciting vacations in Chiapas or a romantic honeymoon, your experience in Parador San Juan de Dios will be a pleasant memory that will last for a lifetime. 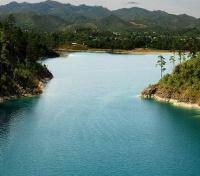 Lagunas de Montebello National Park is home to 59 lakes of varying size, which are collectively known as the Montebello Lakes. Declared a Biosphere Reserve by UNESCO in 2009, the area boasts an incredible variety of endemic wildlife which you will discover alongside your expert guide as you travel from lake to lake. You may come to wonder if your eyes are deceiving you; no, the lakes do in fact change color. Some are hued green, some blue, while others are purple or even black due to the mineral content resting below. While swimming is forbidden, you are able to rent a rowboat or to arrange a horseback ride around one of the lakes (not included). Following a brief pause in the day, you will visit the archeological zone of Chinkultic, located within the Lagunas de Montebello National Park. Here, over 200 buildings, though not very large, rest beautifully. The Castillo is the main structure, sitting on top of a natural hill, with a steep cliff at its edge that drops off into a cenote, a natural pool in the limestone. Your guide will suggest a suitable place for lunch based on the day’s logistics (meal not included), and upon completion of your tour you will be driven back to San Cristóbal de las Casas. This service includes private transportation, bilingual guide, entrance fees, water, and local guides where mandatory. 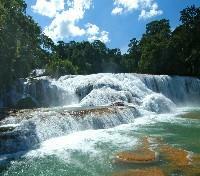 With an early morning check-out, you'll be met by your private bilingual guide in the hotel lobby and depart on a full-day excursion as you transfer to Palenque, with a tour of the Agua Azul Waterfalls along the way. 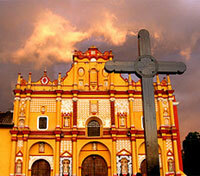 Before departing San Cristobal however, you will explore the colonial city with your private guide and transportation. 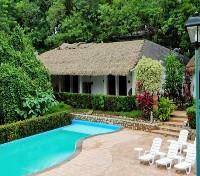 San Cristobal is characterized by its peaceful and welcoming atmosphere, coupled with an artistic and bohemian flair. The colonial streets and alleyways lined with red-roof tiles and white-washed walls beg wanderers to explore and discover the nooks and crannies; alleyways open up into picturesque arcades and plazas showing off their authentic colonial architecture and hosting churches, museums, cafés, restaurants and artisan workshops, among other delights. After your tour, you'll begin the 3.5 hour drive to Palenque, splitting up the trip with a visit to the beautiful and impressive water attractions of Agua Azul, and Misol-Ha. Situated among lush vegetation, the waters of Agua Azul descend through the hills in a rapid succession of falls, and end in pools of deep turquoise, while the Misol-Ha Waterfall is a thin jungle cascade with an exceptional 35m plunge down to the pool below. 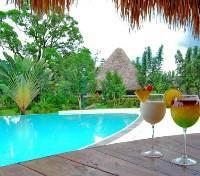 Hotel Villa Mercedes is a hotel in San Cristobal de las Casas that prides itself on service and hospitality. A modern retreat inspired in the tropical forest, Villa Mercedes Hotel has an exceptional location 5 minutes from the legendary Archaeological Site and a few miles from spectacular landscapes, lakes and waterfalls. Surrounded by the most exotic natural beauty and gorgeous gardens, Villa Mercedes Palenque Hotel has been designed for families and business travelers. 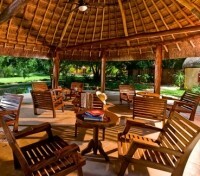 Villa Mercedes features 92 comfortable 5-star accommodations for you to enjoy a pleasant experience and facilities that include pool, temazcal, spa and restaurant, among many other elements that make Villa Mercedes a unique choice among hotels in Palenque, Chiapas. In the early morning you will meet your guide in the hotel lobby to set out on an unforgettable expedition to the remote, lost wonders of the Lacandon jungle; the Mayan archeological sites of Yaxchilan and Bonampak. While touring Bonampak, you will enter the Temple of the Murals and have access to three rooms that have brightly colored depictions of Maya life. Your expert guide will help you to decipher the scenes and will explain how the Maya were able to create such vibrant hues using natural materials. 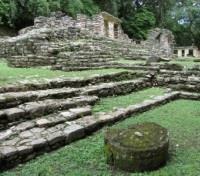 Next, you will head to Yaxchilan. This ancient city’s unique position on the mighty Usumacinta River made it one of the most important sites in the Mayan world as the center controlled trade throughout the region. Inscriptions here allow us to know more about the ruling Jaguar dynasty than is known about almost any other ruling clan. As you explore the ruins, the calls of large troops of howler monkeys remind you just how far from modern civilization you are and how powerfully alive the Lacandon forest remains. Time for lunch will be provided on tour, and dining suggestions will be made based on the day’s logistics (meal not included). This service includes private transportation, boat transfers, bilingual guide, and entrance fees. Enjoy your flight from Villahermosa to Merida. The approximate flying time is 1 hours and 20 minutes. Pick up from the airport in Merida and transfer to your hotel in Merida or vice versa. Located just 15 minutes from the historic center of Merida, capital of Yucatan, Hacienda Misné is a historical building of the eighteenth century in which elements of the Spanish and French colonial architecture that makes it a unique construction are mixed in its type. 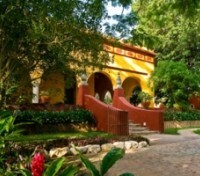 The Hacienda has a beautifully restored principal house, the property is surrounded by walls that protect the Hacienda and its lush tropical gardens. The history and local tradition combined with the natural beauty of its exuberant gardens, the singing of the birds and the sigh of the breeze makes it feel as if time has stopped. 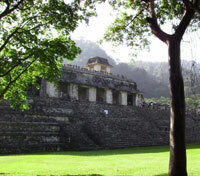 Pick up from your hotel in Merida and transfer to Chichen Itza for a private tour of the ruins. Chichen Itza was a major regional center in the northern Maya lowlands from the Late Classic through the Terminal Classic and into the early portion of the Early Postclassic period. The site exhibits a multitude of architectural styles, from what is called “Mexicanized” and reminiscent of styles seen in central Mexico to the Puuc style found among the Puuc Maya of the northern lowlands. 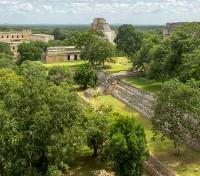 Following the decline of Chichen Itza's hegemony, regional power in the Yucatán shifted to a new center at Mayapan. The ruins of Chichen Itza are federal property, and the site’s stewardship is maintained by Mexico’s National Institute of Anthropology and History. 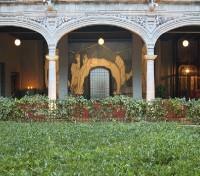 At the end of your tour, you will be transferred back to your hotel in Merida. Enjoy your flight from Merida to Mexico City. The approximate flying time is 2 hours and 10 minutes.